From the moment that I saw this khaki duster jacket on the River Island website, I knew that I had to make it mine. I’ve worn it so frequently since I bought it and I’m always getting asked where it is from. At the time, I sent out the link when I could but its now out of stock and I’ve had some more girlies asking where to buy it from so I thought I’d put together a post filled with khaki jacket and coat alternatives. The great thing about wearing a khaki jacket is that it will go with SO many different outfits throughout the autumn. In fact, khaki was still very much in fashion all throughout the spring and summer and with this being a lighter material, it is going to be ideal to wear from spring through to autumn as you can change your clothes underneath and accessories to suit. Khaki is such a universally flattering shade whether you’re light or dark skinned, blonde, brunette or a red head. With such a great range of plus size fashion retailers now, there’s plenty of options available for all sizes. 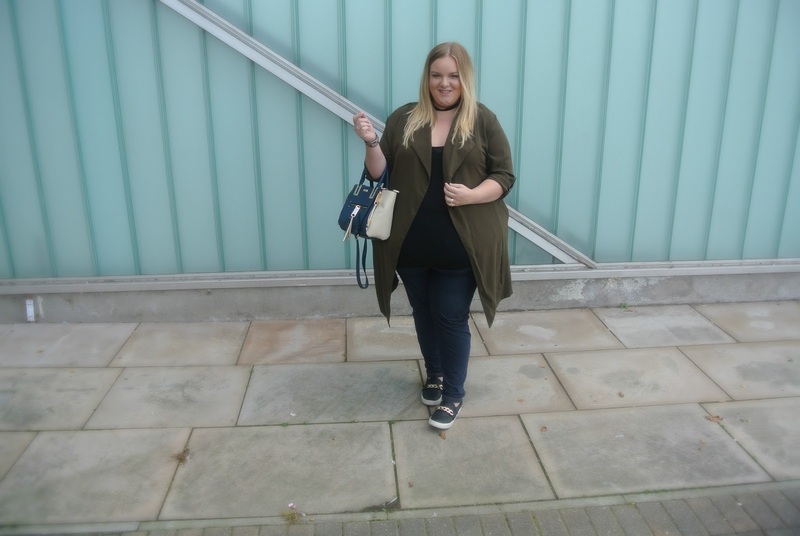 I’ve put together some of my favourite plus size picks from lots of different websites so that you can rock the khaki trend this autumn too. Included are lots of different shapes and styles as well as some thicker pieces which are more suitable for winter. Click the arrow to the left and right to see more of these gorgeous plus size khaki coats. Many of them are on sale at the moment so its a great opportunity to bag yourself a bargain. Whenever I’m shopping online, I always like to check out voucher websites like this site here to see if I can get a discount on the items that I’m buying. With the cost of living rising, why would you want to pay more for your items when you can get a coupon to reduce the cost? I’m all about wearing gorgeous clothes but updating my wardrobe can get pricey, even if I only do it every now and again. I’m getting quite good at shopping wisely though so perhaps I’ll put together a post on how to grab yourself a bargain online soon! Which is your favourite What is your favourite clothing colour for autumn? Previous Post Degustabox October Plus HUGE Discount code! Next Post My Top 10 Tips On How To Be A Savvy Shopper By Saving Money and Time and Buying What You REALLY Want! What a fab looking jacket I love the color I just wish it would suit me but khaki just never looks right on me. I love a good khaki jacket, it looks fab on you! I have a similar jacket that I bought in Debenhams about six years ago – still going! is there anything that doesn't look good on you? i wish i could pull of khaki like you! That type of coat is definitely a hit this season. Nice selection! The River Island coat is so stylish and really suits you. I love their current range. I love this entire look Laura. You look amazing. The shoes are my fav. It's a great colour jacket. I'm feeling the cold now o don't think it would be warm enough for me. I recently invested in a lot of khaki coloured clothes and I am loving it! love your jacket! Its so amazing to see brands coming upon with more plus sized clothing! its amazing! looks great on you 🙂 but for me that seems to be constantly chilly, it doesnt look warm enough!